This photo was taken at about 1 pm after a brief let up in the rain. The "Take It!" 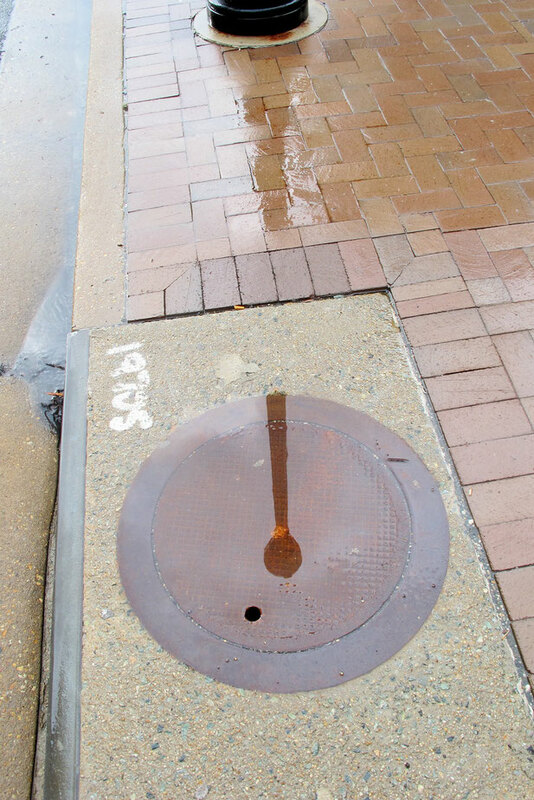 came from the combination of how unusual it was to find a puddle formed by a rainy day on a man hole cover. Somehow there is a slight concave to the surface of the casting of the cover as well as a tight seal to the fit of the cover into the hole ring. The combination of all this allowed for just a little more accumulation of water to help make the image of the street light shadowflection that much longer. There is an interruption in the image and then completion all the way to the showing of the actual base of the lamp which adds to the fun of the shot. It would be fun to find out what the spray painted numbers on the concrete are calling for. The After Take: This is one of those easy to look at shots and is about symmetries as much as anything. Every once in a while I like a photo that is not hard work to look at and is not calling for the viewer to do anything but know exactly what they are seeing. Hope your day has had some easy to look ats in it. PS: I think you may have gathered the origin of the titile being a combination of Shadow and Reflection which this photo seems to represent. Could the lamp post top shadow be considered a bit of an exclamation point? The name you came up with really compliments the picture. I agree Gabe, very clever.